Raport Final si Revolutia: Reciclare sau Rotatie de Texte? 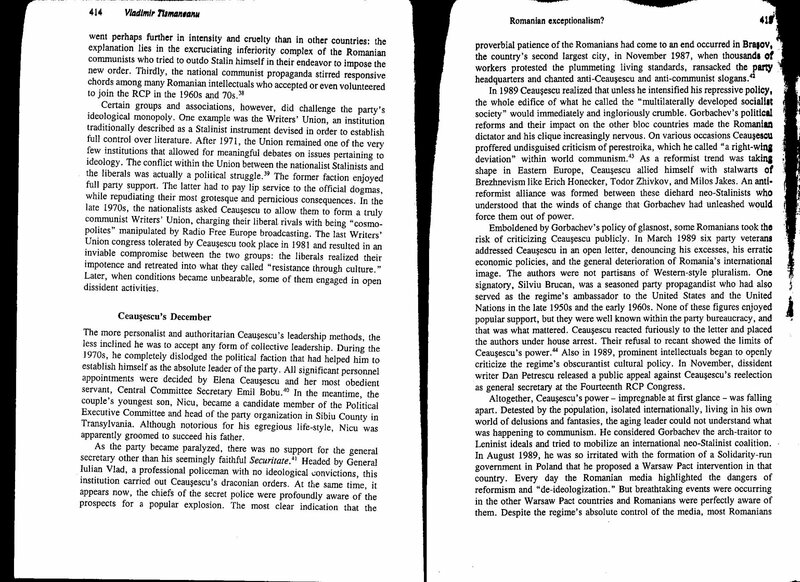 …A textual comparison of the Report’s chapter on the Revolution and Vladimir Tismaneanu’s chapter in a Dawisha and Parrott edited volume from 1997 is unambiguous: the introductory two paragraphs of the Report’s chapter are taken verbatim in translation from p. 414 of Tismaneanu’s 1997 chapter, and other verbatim paragraphs, sentences, and phrases from pp. 414-417 make up parts of the rest of the Report’s Revolution chapter without any reference to the 1997 chapter…. Sorin Iliesiu, “18 ani de la masacrul care a deturnat revoluţia anticomunistă,” 21 December 2007, found at http://www.romanialibera.com/articole/articol.php?step=articol&id=6709 (note: this is NOT the Romania Libera daily newspaper). One will find many well-known names in the West among those who signed this petition: Dragoş Paul Aligică, Matei Călinescu, Ruxandra Cesereanu, Anneli Ute Gabanyi, Tom Gallagher, Gabriel Liiceanu, Norman Manea, Nicolae Manolescu, Mircea Mihaies, Ion Mihai Pacepa, Horia-Roman Patapievici, Radu Portocală, Nestor Ratesh, Lavinia Stan, Stelian Tănase, Alin Teodorescu, and Vladimir Tismăneanu. Sorin Iliesiu, who is a filmmaker and Vice President of the “Civic Alliance” organization, has written that he was part of the “team” that “edited” the seven page chapter on the Romanian Revolution contained in the Report of the Presidential Commission to Analyze the Communist Dictatorship of Romania (PCACDR). He is not a scholar and most certainly not a scholar of the December 1989 events. 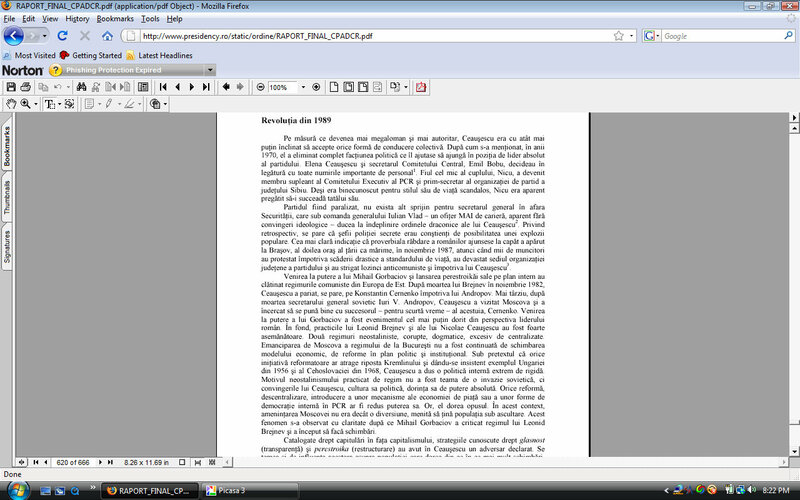 A textual comparison of the Report’s chapter on the Revolution and Vladimir Tismaneanu’s chapter in a Dawisha and Parrott edited volume from 1997 is unambiguous: the introductory two paragraphs of the Report’s chapter are taken verbatim in translation from p. 414 of Tismaneanu’s 1997 chapter, and other verbatim paragraphs, sentences, and phrases from pp. 414-417 make up parts of the rest of the Report’s Revolution chapter without any reference to the 1997 chapter. As the author(s) of an earlier chapter in the Report cite(s) Tismaneanu’s 1997 chapter (see p. 376 fn. 55) correctly, this leaves really only two possible explanations for the failure of Iliesiu et. al. to cite that they have borrowed wholesale from Tismaneanu’s 1997 chapter: a) an absence of scholarly knowledge, or b) an attempt to mask their dependence upon and deference to Tismaneanu, the Chair of the Commission, since the citations that do appear are the exact citations from the 1997 chapter and claims are translated word-by-word, so much so that Iliesiu et. al. did not even bother to change verb tenses despite the passage of a decade. Iliesiu et. al. can attempt to avoid answering questions and attempt to change the subject, but the textual analysis is unambiguous: Tismaneanu’s unattributed 1997 chapter forms the bulk of the Report’s chapter on the Revolution. The only question that needs to be answered is: why and why are they unwilling to admit the textual identicality? This entry was posted on December 18, 2010 at 1:40 pm	and is filed under decembrie 1989, raport final, Uncategorized. You can follow any responses to this entry through the RSS 2.0 feed. You can leave a response, or trackback from your own site.